It’s a simple statement but it represents so much more than just four words. For many people, it is a rallying call for closing the gap between men’s and women’s wages, ultimately achieving the goal of pay equity, and protecting a notion of basic fairness. Others question the very idea of what equal work means, with some people arguing that women make different career choices compared to men and that any gap is merely a reflection of those choices. But in the United States, there are many historical examples of inequality affecting women including: denial of property rights, the right to vote, the ability to obtain higher education, and barriers to particular occupations and specialized careers. Given the complex history of women’s equality in the U.S., we wanted to find out what people think about the current state of working women and their pay relative to men. 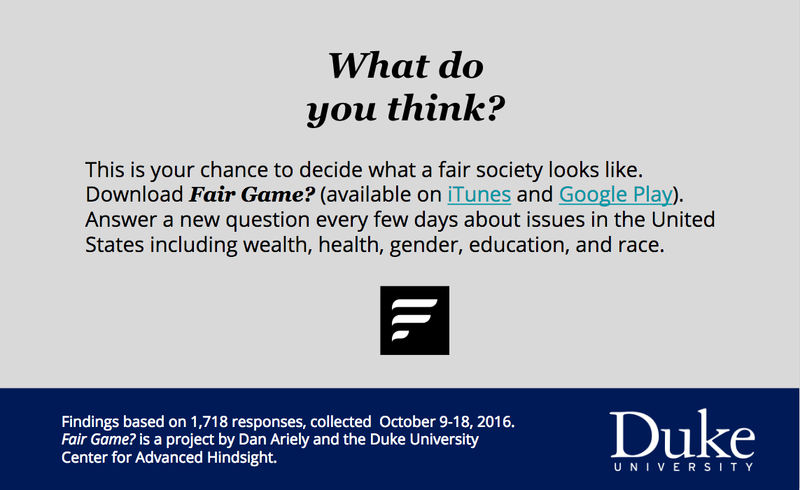 We focused on the gender wage gap for topic 2 of Fair Game?, our new app that asks users what they think about the world as it is today and what they would want in a fair world. Surprisingly, people tend to overestimate the gender wage gap and believe women earn 73% of men’s income. In reality, women are estimated to earn 79% of men’s income. How much do people think women should be paid in a fair world? 93% of men’s income. Overall, responses did not dramatically differ by the age of the user. How does your own gender relate to what you think about this? Male and female users both overestimated the magnitude of the gender wage gap, with men thinking women currently earn 74% of men’s salaries, and women estimating that they earn 70% of men’s salaries. There was closer agreement for the question of what a fair wage gap should be, with males preferring 93% and females preferring 94% of men’s salaries. On the whole, both genders perceive a gap to exist in the United States and would substantially – but not completely – close that gap in a fair society. And can we observe differences in views according to political beliefs? People who identify as conservative and those who identify as liberal only differed by 4% in terms of what they believed the gender wage gap to be, and 3% in what they thought it should be in a fair world. Conservatives estimate women’s salaries to be 76% of men’s, while liberals put that percentage at 72%. In terms of what they think would happen in a fair society, conservatives consider 91% and liberals consider 94% to be a fair ratio of women’s to men’s income. Despite these relatively small differences, on average, the increase in women’s salary thought to yield fairness would be 15% for conservatives vs. 22% for liberals. The gender wage gap is a topic that deserves careful consideration. Although a single number represents an average for all women, the number varies substantially once we consider factors including race, age, education, profession, career trajectory, childbirth status, and U.S. state of residence, to name a few. There is also likely to be some gender role stereotyping at play in the results we received, with many of our respondents probably assuming that the burden of childcare would or should fall disproportionately on women. This is a complex topic, but we can learn from some efforts to equalize opportunities in the workplace for women. A program in the Canadian province of Quebec provided an interesting natural experiment, demonstrating that subsidized daycare could support an upsurge in employment of women that in turn boosted economic output to a level that more than paid for the childcare subsidy costs1. A final consideration is how long it will take to close the gender wage gap, given the progress that has already been made. One measure of improvement (the upward trend since the 1960’s), predicts the gap to close by 2059. But if a recent slowdown in the trend persists, the gap would not close until 2152. What other efforts do you think might be worthwhile to pursue to help close this gap, sooner or later? And please join us and play along by downloading Fair Game? from iTunes or Google Play. Fortin, Pierre et al. (2012). Impact of Quebec’s Universal Low-Fee Childcare Program on Female Labour Force Participation, Domestic Income and Government Budgets. Sherbrooke: Research Chair in Taxation and Public Finance, University of Sherbrooke.